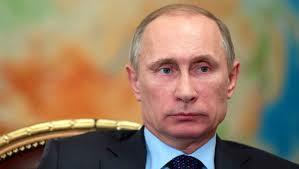 designtocaredaily: Vladimir Putin Is Elected for The Fourth Time As Russian President. Vladimir Putin Is Elected for The Fourth Time As Russian President. 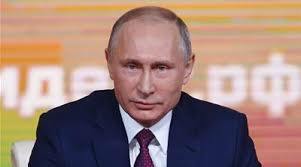 Senior Russian officials have said that Vladimir Putin’s decisive win in the presidential elections reflects popular support for his muscular foreign policy and would bolster his role as a counterweight to the west. Putin’s victory, with a 76.7% share of the vote, comes amid high tensions between London and Moscow over the nerve agent attack in Salisbury. Investigators from the Organisation for the Prohibition of Chemical Weapons arrived in the UK on Monday to begin testing samples from the 4 March attack, which Putin has denied was Moscow’s doing. There was a certain swagger in Moscow after Putin’s victory. His campaign head thanked Great Britain for mobilising Russian voters over the nerve agent attack. Putin’s first executive order of the day was to call up army reservists for military training. But opposition activists highlighted a number of cases of vote rigging and statistical anomalies, including millions of votes cast in polling places that recorded exactly 85%, 90% and 95% turnout. The respected Russian business daily Vedomosti also noted the appearance of nearly 1.5 million votes overnight, equivalent to 2% of the vote. The total number of ballots cast on Sunday for Putin, who has spent 18 years as Russia’s most powerful politician, exceeded 56.2m. That was a record total, even discounting the nearly 1m votes he gained as a result of the 2014 annexation of Crimea. The Organisation for Security and Co-operation in Europe (OSCE) said on Monday there had been no real choice in Russia’s presidential election and complained it had been marked by unfair pressure on critical voices. “Choice without real competition, as we have seen here, is not a real choice,” the OSCE said in a statement, adding that restrictions on fundamental freedoms, as well as on candidate registration, had limited the space for political engagement. Russia’s central election commission said on Monday morning that it had not registered any serious complaints of violations. Putin’s most serious rival, the opposition leader Alexei Navalny, was barred from the race. The central election commission said that the communist candidate, Pavel Grudinin, came second with 11.8% of the vote, and third was the ultranationalist Vladimir Zhirinovsky (5.6%). The only candidate to openly criticise Putin during the campaign, the liberal TV star Ksenia Sobchak, won 1.6%. Putin has never faced a serious threat to his rule since he came to power on the eve of the new millennium. He won 53% of the vote in the 2000 presidential election, 71% in 2004 and 63% in 2012. Turnout at the elections on Sunday was more than 67%, the commission reported. The Kremlin had initially sought a 70% share of the vote with 70% turnout but was said to have lowered its expectations as the election drew closer. About 10 million more Russians voted for Putin than in 2012, when he appeared on the defensive after mass voter fraud at parliamentary elections sparked protests in Moscow and other large cities. Perhaps the most surprising result came from Moscow itself, where Putin won just 47% of the vote in the 2012 elections. On Sunday he took 70% of the capital city, one of the main bastions of the opposition. The opposition pointed to video evidence of voter irregularities at a number of polling stations across Russia. They included ballot stuffing and attacks on some vote observers, as well as reports of ballots being cast by “dead souls”, people who have died but remain on the electoral rolls. In one video shared online from the Siberian region of Yakutia, voters patiently queued behind a man shoving ballots into the ballot box. Turnout is usually highest in the North Caucasus, where a machine of administrative support regularly pushes turnout, and vote share for Putin, above 90%. In Dagestan, an election monitor said he was beaten by a crowd of several dozen men. During the encounter turnout at his polling site jumped significantly. One polling place in Chechnya, where observers managed to remain until the end of voting, showed just 35% turnout. In others where there were no observers, it was close to 100%. The Kremlin had pushed a broad get-out-the-vote campaign before the elections, apparently concerned that Putin’s popularity might not be enough to get voters to the polls. Incentives included raffles for prizes including iPhone Xs and cars. On Sunday night Putin’s campaign chairman declared turnout to be high and needled London by suggesting that it may have been a rally-round-the-flag response by voters to the accusations of Russian involvement in the nerve agent attack on a former spy in the UK.